This poster is a lie. Combat Shock is about Frankie, a man utterly and completely broken. He is haunted by flashbacks of the horrors he witnessed as a soldier in the Vietnam war. Everything in Frankie's life is in bad shape. He has no money, his family is starving, his baby is deformed due to Frankie's exposure to chemicals in Vietnam, and if that's not enough, he wakes up to find an eviction notice waiting for him. Loan sharks are constantly hunting him down. The unemployment office has no work for him. All of his friends are heroin addicts. There's not many options left for him, but he still goes through the motions because he doesn't want to be a criminal. He doesn't want to hurt people, but everyone's sanity has a limit, and Frankie's has been stretched incredibly thin. Combat Shock isn't a horror movie. I don't know why it was listed under the horror section, but I imagine it has something to do with the final 10 minutes. It's not enough that it beats you down over the course of 80 minutes, it really has to drive it home with the final 10. The ending is audacious, and it's bound to rub people in the wrong way, but chances are that most people would have turned this thing off 45 minutes earlier. It truly cements this movie as a feel bad time. 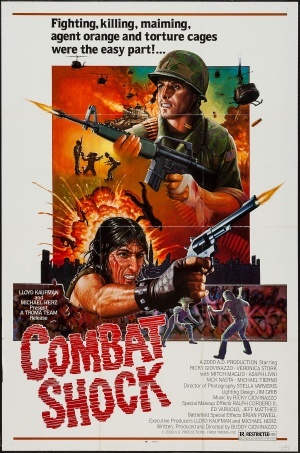 Lloyd Kaufmann claims Combat Shock as one of Troma's masterpieces. I wouldn't go that far, but it is thematically consistent and occasionally visually appealing, with some clever editing and projector trickery. It's also aggressively depressing, sardonic and harsh. So while I wouldn't go back to it for a second look, it definitely delivered way more than I expected.